You are here: Home / associations / Does Association Community Management Need Its Own Association? What could be more meta than a conference for community managers to talk about community management? How about an association conference for association community managers to talk about managing association communities? Ok, sorry–I’m in post-conference stupor after my first-ever SFPE annual conference (Society of Fire Protection Engineers) and also still thinking about the Higher Logic Super Forum (HLSF) I attended last month so my brain is full of association/community management/conference musings. The fun and frenzy of conferences, the connections you can only make at face-to-face meetings, the joys and frustrations of associations…sometimes I wish I could just think about normal stuff like normal people for once. Oh well–that’s what blogging is for, I guess. At any rate, if you read my blog you know I’m a little obsessed with the topic of association community management, even though my role has expanded to focus more broadly on communications and my days as “just” a community manager (as if…) are, at least for the moment, behind me. So naturally, in the aftermath of the HLSF, when I saw a discussion on HUG (Higher Logic’s user community) about professional associations for community management, I couldn’t resist weighing in on the topic. While there are certainly no shortage of online communities for community managers: FeverBee, CMX Hub, dozens of Facebook groups and LinkedIn groups and Yahoo groups and online forums and Twitter chats…to me, the closest thing to a community management association is the Community Roundtable. There is SocialMedia.org, but that’s for social media managers at big brands, and thankfully the world seems to have established once and for all that there’s a difference between social media management and community management. So the Community Roundtable it is, then, in terms of the closest thing to a professional association for community managers (at least that I’m aware of–please feel free to correct me in the comments if there are others) an organization of which I was a member for several years and am still a rabid fan of. The discussion on HUG mostly centered around the fact that the Community Roundtable’s dues are well beyond typical association dues ($1,500), which apparently for-profit companies don’t bat an eye at, as, at least when I belonged, most members were from for-profit companies where community management training is seen as something worth investing in. As a former member of the Community Roundtable, I can attest to the fact that yes, the dues are steep in relation to most association’s dues, and, understandably, it’s an issue for association community managers who are mostly struggling to justify their position at their organization. Even if they work for large budget association, they probably aren’t likely to get approval for the cost for the simple reason that associations don’t value community management and don’t see it as an actual discipline. I make no bones about the fact that I am a huge fan of the Community Roundtable, and was lucky to work for a large association that paid my dues some years (it cost less when I was a member, but was still higher than most association annual dues); others I paid it out of pocket even though it was a big investment because it was worth it. If I were still a community manager, I’d still belong. How many associations pay not only ASAE dues, but also registration and travel for multiple staff to attend one or more ASAE conferences a year–easily more than $1,500 a year per person? A lot. 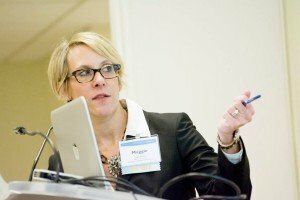 So obviously associations–even small ones–are willing and able to pay dues to ASAE and many other associations that support other disciplines within associations–marketing, PR, information management, accounting, publications….basically any position on an association’s staff has at least one association representing that profession. So money isn’t the issue; it’s the value that associations place on the discipline of community management…which, at present, stands at about…not much. So given all this, what I wonder is whether, for community managers who manage association communities–is there value in belonging to an association for community managers, even though there are myriad free online groups that focus on community management? Or, to take it a step further, what about an association for association community managers? What is the value–if any–of an association beyond providing a forum for professionals in a certain field to connect with one another and chat about issues both professional and personal? Obviously there’s value–check out the Power of A if you need convincing. Even as public social media platforms proliferate and people can easily find and connect around any interest, associations a) aren’t going anywhere and b) private community platforms seem to be becoming as much of a staple as association websites. If community management is a discipline that is still struggling for recognition and resources even as more and more associations invest in private online community software, is there a need for a professional association for community managers? And/or one specifically for association community managers, since managing online communities for associations presents unique challenges that brands, startups and for-profit don’t have to worry about? As both a believer in the power of associations and a former member of the Community Roundtable, I personally think that yes, there is value and that, while discussion on whatever free platform of choice is nice, and having a place to share challenges and seek support and guidance is of great value, a not-for-profit association for community managers is something that could help elevate the stature of community management in the association world. I mean, there’s an association publishing association. There’s obviously ASAE. There are associations for medical and engineering society execs. Is it so far-fetched to think that there could–and should–be one for association community managers? But then I think about it for a second longer and wonder if I’m wrong…does the fact that there are already a bunch of conferences and reports and other for-profit endeavors around community management mean that there’s no need for a community management association, let alone one dedicated to association community management? 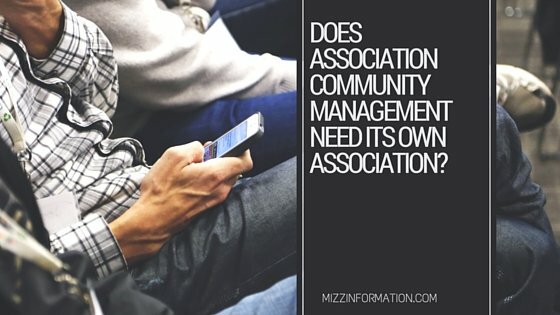 Is association community management something that will just be claimed by the software vendors that provide the platforms for those communities, with their user conferences and resources the only resources that association community managers have access to? And, if yes, is that fine…or should it be something that is platform-agnostic and separate from the vendor world?